Now that all the record and book stores have gone away, shopping at the mall just ain’t what it used to be for The Pizza Snob. It’s just all clothes! 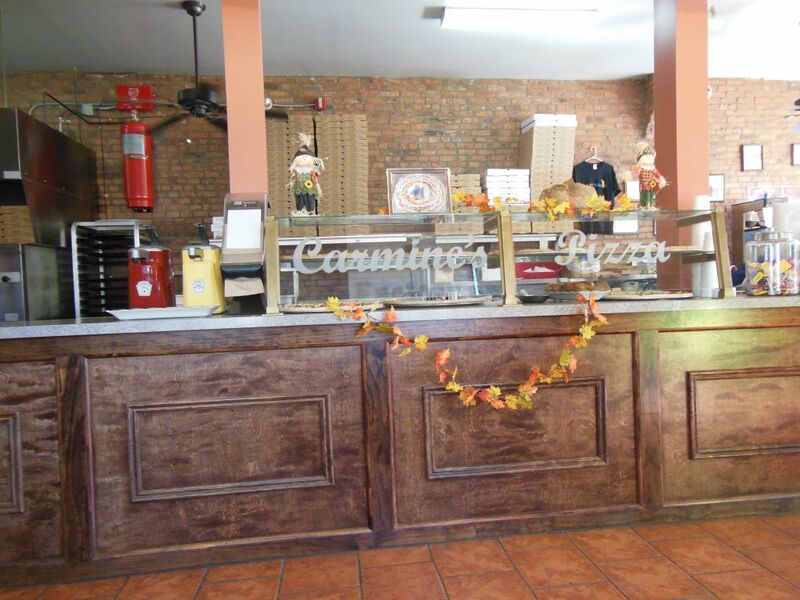 So, when Ms. Pie wanted to take my Mom and Dad to Jersey City’s Newport Mall, I found myself a pizza diversion–Carmine’s Pizza Factory just a short drive away. Thinking that parking would be scarce, I grabbed a spot on 8th Street several blocks away. And, I didn’t mind at all. On this pleasant fall day with leaves dropping from the trees, I enjoyed my stroll through the lovely, quiet, old neighborhood. 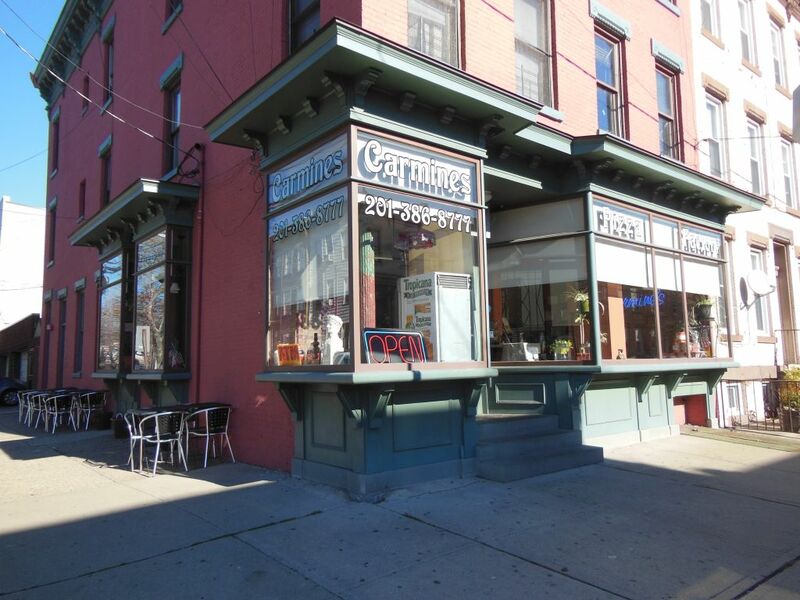 Nestled between Hamilton and Jones Parks, Carmine’s sits on the corner at the end of a row of attached two-story walk-up homes. Although there was some comfy outdoor seating, the slight chill made this an inside day. Inside, Carmine’s has a two-layered glass display offering a variety of different slices. 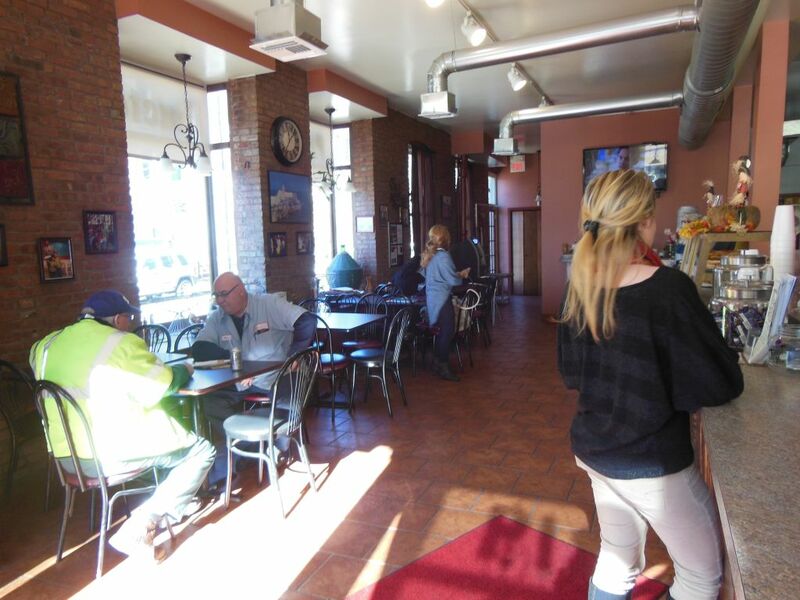 With a clear focus on pizza, Carmine’s also offers some other Italian dishes and salads. It was still early for the lunch crowd, so I easily ordered my plain cheese slice ($2.00) at the counter. I grabbed a table while I waited in their good-sized dining area. As lunch time approached, I found that Carmine’s was a popular place as a line started forming at the counter. Today’s lunch crowd included some students, most likely from nearby St. Anthony’s High School. While waiting, I noticed 2012-era photos on the wall of owner Carmine Testa’s then seven-year-old son tossing a pizza. It seems the kid’s talent found its way both into the local newspaper (under the banner “This Kid Can Throw”) and on the Steve Harvey television show. You can watch the father and son in action here. Wow! He’s amazing! Back when I went to high school in Jersey City, I don’t recall Carmine’s being around. Last year, my revisit to my old Jersey City haunt, Three Guys from Italy resulted in them making the Pizza Snob Hall of Fame. The slice I just had at Carmine’s is knocking on the Hall door. Perhaps a hotter and more oven-fresh slice next time will get them there. 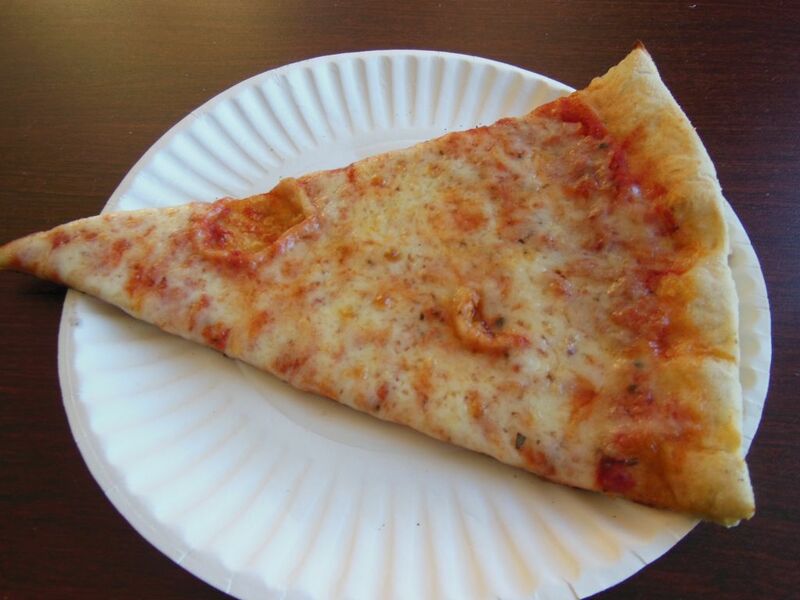 Still, a slice at Carmine’s should not be overlooked! I plan on returning someday, and maybe I will even get to see some pizza tossing next time! ← Bayonne, NJ’s Big Apple—Watch Some Sports and Eat Some Great Pizza!